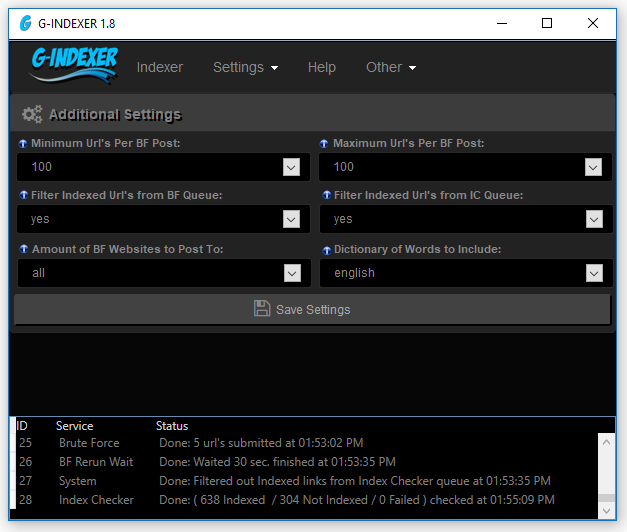 A new platform was added to the Brute Force to help increase indexing rates. There will be a few more platforms coming soon as we continue to add them. & memory as it has while running in the background. The Indexer at this time uses only one method to index your webpages and links. This method known as Brute Force forces Google to show your pages attention by crawling and almost instantly indexing them. It can take anywhere from a few minutes up to an hour for them to start indexing your pages. The Auto Mode can be used to submit a folder of text (.txt) files that contains a list of urls. Once started you can drop new files into this directory and they will also be submitted for indexing. Makes life a little easier not having to constantly copy and paste your urls into the Url List textbox. The Main Settings tab is where you provide the needed details to make the submission possible. Details such as your 2captcha.com key (message me if you need a captcha solver), Google Shortner API Key, as well as the Google Web App Url used for checking which links have been indexed and which have not. The Additional Settings can help randomize your submission, making it harder for the google bot to pickup a pattern. Use this to randomize your submission and more of your links will be picked up and indexed on the first Brute Force run. 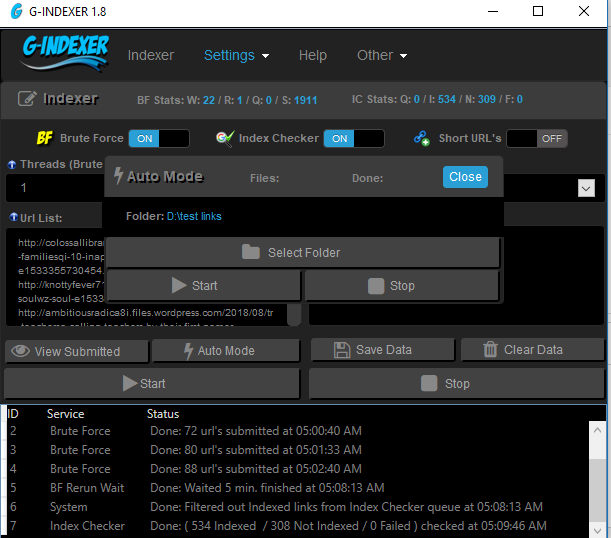 In this version the two biggest features that were added is the Auto Mode and Index Checker. We've also added more control over how G-INDEXER can be used to randomize your submissions by adding in some more additional settings. The Auto Mode can be used to submit a folder of text (.txt) files that contains a list of urls. Once started you can drop new files into this directory and they will also be submitted for indexing. Makes life a little easier not having to constantly copy and paste your urls into the Url List textbox. 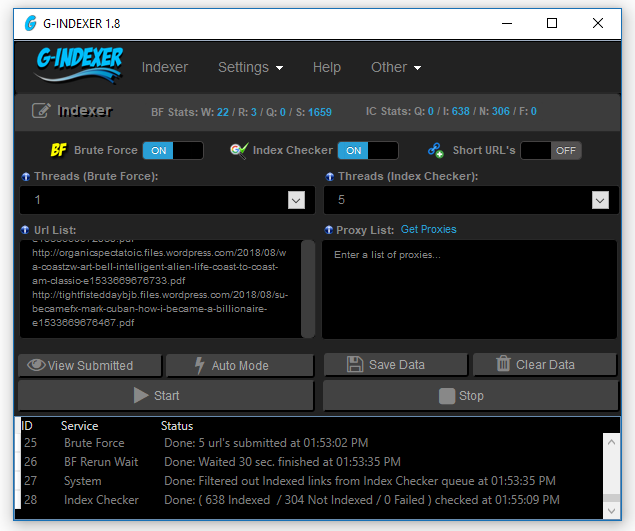 The Index Checker is a great new feature to come to G-INDEXER. Having the ability to now check your links after submitting and before the next Brute Force Rerun the software can filter out the indexed urls from the Url List and focus only on the urls that have not yet been indexed. This means for all of you who are blindly rerunning your links for days to try and get Google to take as many as possible can now be sure that the only links you are running through G-INDEXER are in fact the non-indexed ones. Lets start by first saying old generation services that only create sitemaps and ping to death the url no longer work. With that method of indexing you would be lucky to see your pages start to index in weeks if at all. 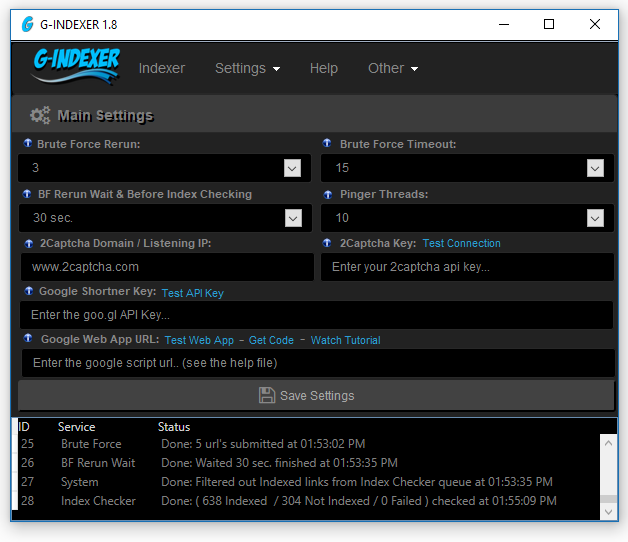 Those of you who doubt what I am saying here I welcome you before purchasing G-INDEXER to go signup with these services and test them yourself. I will see you when you come back still in search of a way to index your links. They may have worked a few years back but no longer work despite all the user who stay subscribed to their monthly services. There were a couple of services out on the market that did work, well up until the removal of the Google Url Submit that is. But now most of them are all sitting dead in the water and are unable to index anything. 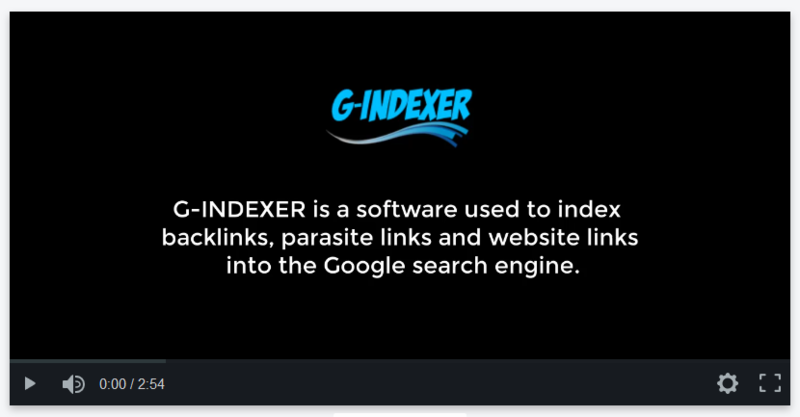 The truth is with G-INDEXER you will once again have the power to index your links. When you purchase G-INDEXER (a one time payment) you own the software for life. You aren't required to keep handing us over your cash each month to use it. Introductory price only and may change. License details will be mailed to you after purchase. This is a one time payment to own G-INDEXER for life. You will also be allowed to install and use the software on two computers simultaneously. I will honor a 72 hour refund policy if for any reason you would like to return it back to me. But please, contact me first to request a refund rather then filing a dispute through paypal and the like. does it require gmail account ? or limit link to submit per day ? No. Google Accounts aren't needed and there is no link limit. Does this use the google site submit form? Yes, submits to Google through their url submit without the need of Google Accounts. I've tried to PM you and add you on Skype. This is a great tool guys. It is a little slow in my testing however indexation rate is through the roof using it. I don't have an exact ratio to follow however be smart and don't abuse this method. If you follow the above you'll end up with great results. No, Google Accounts aren't being used in the background. Was busy with a move over the weekend and have now added you to skype. Looks good. Will you be providing updates? Yes, updates will be included for free for all users. Edited by serps, 23 February 2018 - 03:24 PM. Added you on Skype. Please accept. Licensing details and download link was sent that day. Thank you for purchases. I have now setup automatic issuing of licenses once a payment has been made. So from here on everyone who purchases G-INDEXER will receive the download link as well as your license directly after we receive your payment. I sent you multiple messages in Skype over the last 2 days. I don't want to put my concern here in public. Please respond to my messages on Skype. Best way to contact me is through email. I am not on skype that often. Everyone there has been some recent changes made to Google's Url Submit and it has caused G-INDEXER and other similar services/software that uses this method of indexing to stop working. Well not stop working, but Google's Url Submit is not working at the moment to index any links. The good news is I have an alternative way to get your links indexed and have been working on an update all weekend long. Please be patient and expect an update to be released either Monday or Tuesday. Thanks. So you found a solution? Does it work again? How many links can be indexed how fast now compared to the past? Do I need my own 2Captcha account and proxy to this software? 2) Why you don't recommend brute force for new sites?